FileBot now has it's own App Repository so you can download and install FileBot conveniently from the App Center like any other QNAP NAS package. This package will install the filebot command-line tools. You will be able to run filebot commands from the shell via SSH. This package will install and run the FileBot Node web application. 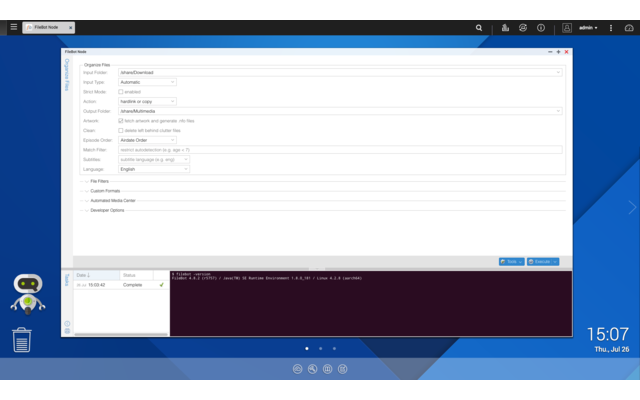 You will be able to execute, schedule and monitor filebot commands with a simple QNAP QTS UI. FileBot requires java. You will need to install the latest Java (Oracle Java recommended) package. FileBot Node requires node. You will need to install the latest Node.js package. Please read How to use FileBot Node to learn how FileBot Node and the filebot command-line tools are meant to be used. Java 8 is required. My Java 8 Installer package will help you install the latest Oracle JDK. Running commands from the login shell is not the same as using cron because they'll not initialize with ~/.profile so keep in mind that $PATH will be different.